Holding out for the ideal mate is crucial to attaining a truly satisfying and enduring relationship. It's never a good idea to settle for less when it comes to love. When you can't find the person who's right for you, dating gets tiresome and discouraging. It's easy to lose hope that you'll ever find the right person, but that's no reason to settle for someone who is not your Mr. or Ms. Right. Dating is no exception to life's rules. When I was first out of grad school, I thought that I was hot stuff because the agency I worked for offered me a starting salary of $12,000 and I was able to talk them into $12,500. Even in those days, that wasn't much money. I was able to manage, but I didn't have much left over at the end of the month and I certainly didn't have anything extra to spend on clothes. Wearing the same thing day after day bugged the hell out of me. In grad school I was able to get by at my internship with a blue blazer and a couple of ties, but working full time at an agency in the Loop was a different story. I was painfully aware that my one sport coat wasn't cutting it. One day at lunch I passed a men's store with a big sign in the window, "Lost Our Lease. Everything Must Go. Prices Slashed." I went in and found a beautiful tweed coat that fit great and was going for a fraction of the original price. I didn't particularly like the lapels, but the deal was too good to pass up. I took it home, put it on, and showed my girlfriend (who now happens to be my wife). She looked at me, looked at the lapels, looked back at me, and then asked me with a tone of disbelief, "What's with the lapels?" My heart sank. I was crushed and was never able to bring myself to take the coat out of the closet again. I wouldn't exactly say that I learned this lesson at the school of hard knocks, but that is how I learned the hard way to hold out for what you really want. Settling for less brings heartache and grief. The goofy thing is that people tend to apply this principle to the mundane aspects of life but not to something as important as love. It kills me when I'm talking to a guy who describes the lengths that he undertook to find the ideal fishing reel or the woman who shopped for hours to find the shoes that were a perfect match for her new purse, but are willing to overlook traits in their partners that they don't like. The response that I usually get when I point this out is "but nobody's perfect." Hold on with that one. Is the guy's fishing reel perfect? Maybe it's not perfect, but it is the ideal for what he was looking for. I know that to a fisherman a good rod and reel is invaluable, and who could argue with the value of the right shoes, but let's put this in perspective. We shouldn't have a higher standard for sports equipment or fashion accessories than we do for someone whom we could potentially marry and spend the rest of our lives with. Once people move beyond the "nobody's perfect" concern, they often worry that they are being too fussy. This is the point where I often hear friends and family quoted. For example, many a well-meaning, but anxious, mother has been known to exclaim, "You're never going to find anyone if you're going to be so picky." It's easy to understand the anxiety that would prompt this statement, but nevertheless, it is not a good message. Not only can pressure from friends and family and pressure that you put on yourself cause you to settle for the wrong person, it can also make you overlook flaws with the rationale that you are setting too high a standard. (BTW, psychologically speaking, the mechanism of overlooking flaws or minimizing their importance is denial. That's the same defense mechanism that permits the alcoholic to declare that his/her drinking isn't that big of a deal.") Many people at this juncture echo the concerns of the mother's statement from above. they declare that the person they are seeing is "really a good person" and question whether they are nitpicking by being hung up on seemingly trivial things. Being too fussy is rarely the problem. If you're at a restaurant and you don't like the gazpacho, you're not being too fussy. The soup is not right for your palate. To overlook this fact would be disrespectful to your own unique, personal taste. Let's talk about a rule that I like to call "if it gets under your skin then it's a big deal." When you have an under-your-skin reaction to something, it almost certainly indicates that the offending trait is symptomatic of a larger issue. Having the confidence to respect your gut reactions is a sign of a high self-esteem. Stating "I'm being superficial" is a put down to yourself and it ignores what your guts are trying to tell you. This is an easy trap to fall into because the offending trait can, at first, seem trivial. Typical examples of things that seem minor but may represent a significant problem include being turned off by your date's car, clothes, or haircut. I believe that it's crucial that you trust yourself enough to recognize that if these things grate on you they are the tips of much bigger icebergs. Laura, a client of mine, found herself in this situation. Despite being attractive and having a great personality her well had run dry in the dating department. She'd been very excited about a new prospect that she'd met on Match.com. He met all of her specs—he was good looking, had a good career, and their predate Internet banter had been going well. However, when I saw her after their date, the first words that poured out her mouth in utter exasperation were, "He drives a Yugo!" Of particular note was the next statement that Laura, an Audi owner made, "I wish I weren't so superficial. What difference does it make what car he drives?" I felt that the comment was way off base. I don't believe that I or anyone else who knows her would ever consider her to be superficial. Yet, this is where she landed and she was really kicking herself. When I was able to get her to stop berating herself and take a more objective view of her date, she was able to identify things that she had noticed on some level but had not fully appreciated the signifcance of. That is, his economic choice of vehicle was part of a pattern (tip of the iceberg) that ran throughout his life. The highlight of a recent trip to Europe had been the deal he got on a hotel room; his greatest source of pride concerned his ablity to find bargains that were "better than Costco"; and he showed their waiter his appreciation with a nine per cent tip. There is nothing wrong with this man's frugality (although the lousy tip really is pretty cheap), but it is not right for Laura. I believe that her ability to accept her true feelings is a sign of self-respect and a high self-esteem. Her Superman will almost certainly buy his cape at Nordstroms. This post is already way longer than I had intended but I would be remiss if I didn't make connections between my advice on dating and something was a part of my childhood, the 1960s TV show, "Lost In Space." Way before I had heard of Freud or Jung, I was painfully aware of Dr. Zachary Smith. You folks of my generation may recall that Dr. Smith was the lead scientist on the Jupiter 2, the spaceship occupied by the Robinson family and crew on "Lost In Space." The show was about the Robinsons et al. who were, as the name states, lost in space, trying to get back to earth. The way that I remember it, there was a formula that was repeated every week. Each episode would begin with the ship landing on a strange planet where all of the capable, competent adults, i.e. all of the adults but the loathsome Dr. Smith, had a job to do repairing the ship. This left nine year-old Will Robinson with nothing to do. He would ask his mother if he could go with Dr. Smith to explore the planet. It should be noted that Dr. Smith was a weasley, cowardly guy who couldn't help but cause problems wherever he went. I'm not sure what Will's mother was thinking but she would let Will go off with Dr. Smith under the condtions that they promise not to go too far and that they take the robot with them for protection. Everybody who ever saw the show remembers the robot. He was this big lovable guy who would start flapping his accordion-style arms when he got excited. Off the three of them would go and before long the robot would stop short and start flapping those arms, shouting, "Danger. 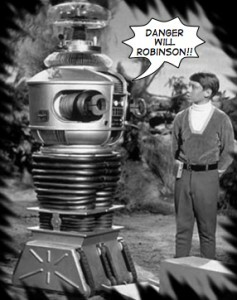 Danger Will Robinson. Danger!" Will would ask, "What is it? What is it?" To which the robot would respond, "Does not compute. Need more data." This meant that he didn't have enough information to know the exact nature of the danger, but nevertheless, his sensors were telling that there was a problem. I believe that we all have something inside us analogous to the robot. Call it gut feeling or a hunch. Ladies, you can call yours "women's intuition." Regardless of what you call it, you must pay attention to it in order to avoid having weird aliens enter your life. Everybody deserves a shot at true love. Don't get me wrong, once you find Mr. or Ms. Right there is still a lot of work that needs to be done to make the relationship work. A successful relationship doesn't simply happen automatically. But in order to give yourself a chance of finding the right partner for you, you have to hold out for the right person. He or she is out there. Keep your sights high. Well put! I like the analogy! Don't think I've heard that one before. Expressed like that, forces one to think about who they're with or who they want to be with.